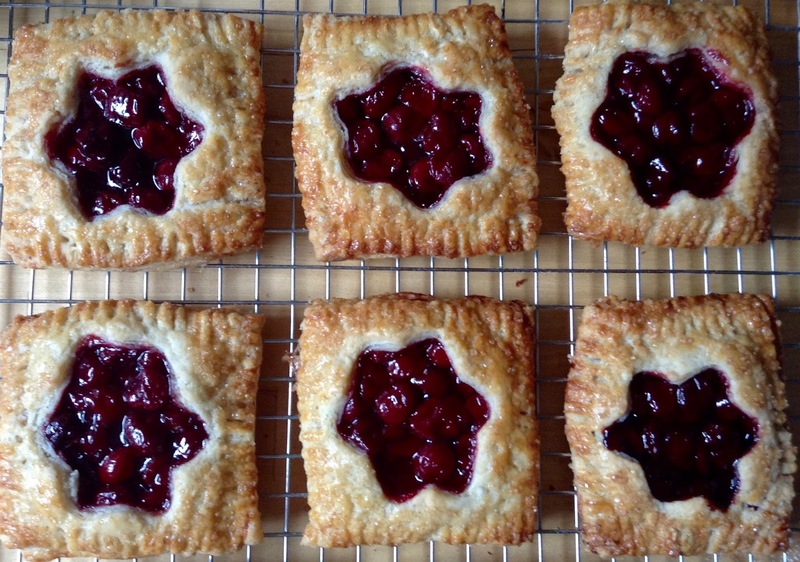 Our ABC July project was exactly what I needed to welcome summer after a rain drenched June: Blueberry Hand Pies, a recipe from King Arthur Flour. These cute portion-sized pies combine two major food groups: buttery pastry and fruit! Since our wonderful native Maine blueberries were not ripe yet, and frozen wild blueberries are not quite as flavorful, I combined them with rhubarb from the garden (as “honorary” berry), and threw some fresh raspberries in the mix. (When I made them a second time, I used sour cherries from our garden). The amount of sugar in the filling was sufficient to balance my tarter fruits, so I didn’t add any more sugar. But first I omitted the lemon juice, until I tasted the cooked fruit. It could definitely do with a little more tang, so the lemon juice went back in. For the dough I used the food processor, which made short work of cutting the butter to the desired pea sized pieces. Adding the sour cream I had King Arthur’s cautioning in mind: the dough will not be cohesive. Emptying the bowl on the counter I found this quite the understatement – not cohesive? Without the slightest feelings of solidarity, the crumbles did their best to avoid contact with their comrades, rolling madly around and trying to escape to the floor. No worries about the crumbles: the dough will eventually cooperate! Here my soda bread making experience came handy, I told myself not to get nervous, and managed, with a little bit of milk to moisten my hands, (and without brutal force!) to coax the rebellious crumbles into a rough semblance of a dough. A piece of plastic foil helps here, too, you can press on the crumbs without them sticking to your hands (or, later, to the rolling pin). 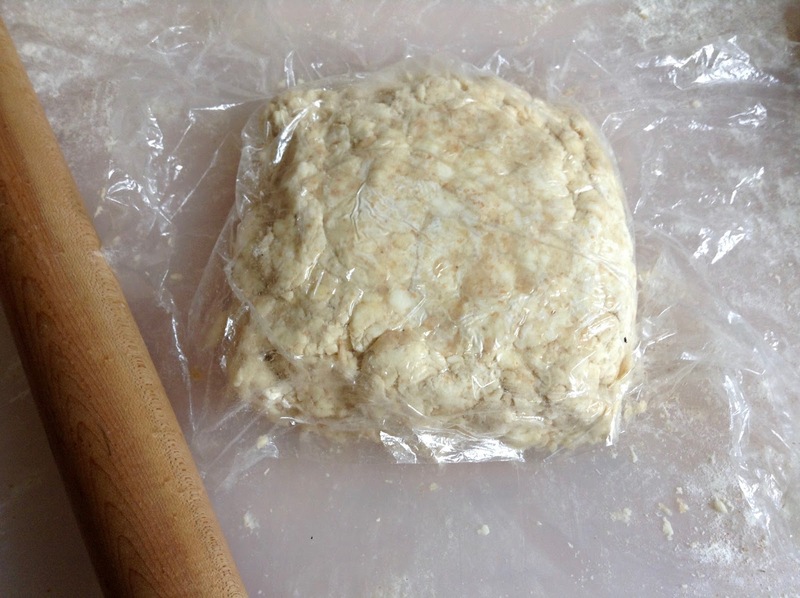 The turns – rolling and folding the dough – were less difficult than I expected. Even though the dough was brittle and got some cracks in the process. Since it was a really warm day, and the dough started to stick a bit, I put it after the first turn for a few minutes in the freezer, to firm up again, and, also, gave it an overnight rest in the fridge before shaping and baking it the next day. The little cut out stars from the vents made nice little cookies. We liked the crunch and taste of raw sugar as topping better than sparkling sugar that added nothing to the flavor. Looking at those cute little pies we knew: they had to be great. They didn’t earn their 5-star reviews for nothing – the were absolutely delicious!! Definitely something I will make again! 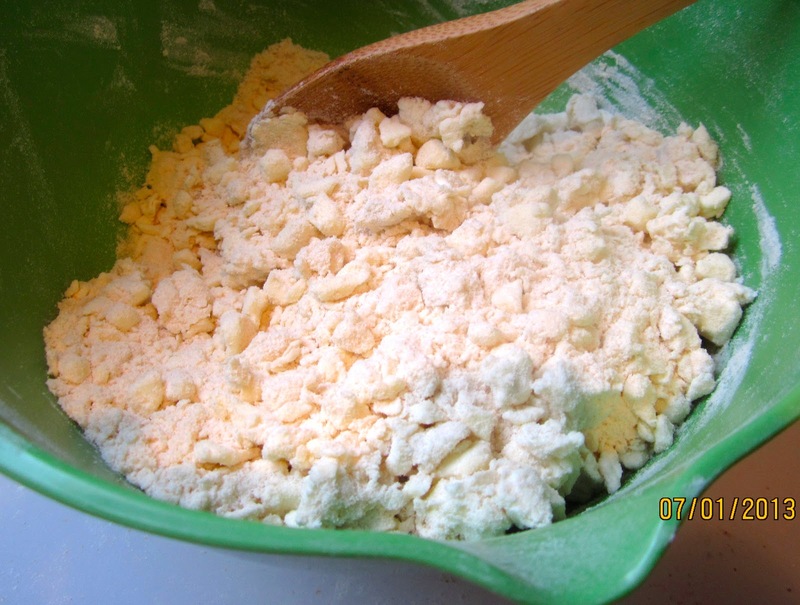 Using a food processor, add flour, salt and baking powder to bowl, and pulse a few times to combine. 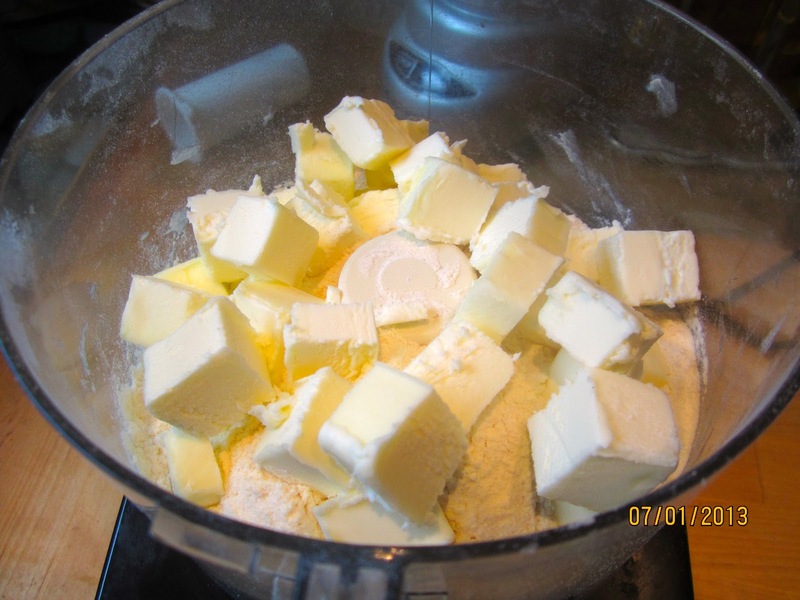 Add butter and pulse, until mixture is crumbly, but leave most of the butter in large, pea-sized pieces. 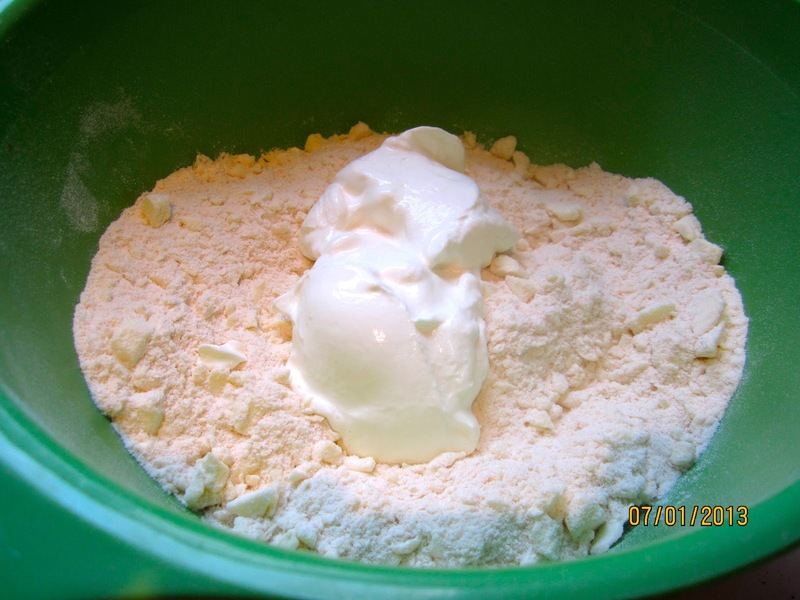 Or whisk together flour, salt, and baking powder in medium bowl, add butter, and work with hands or pastry cutter. 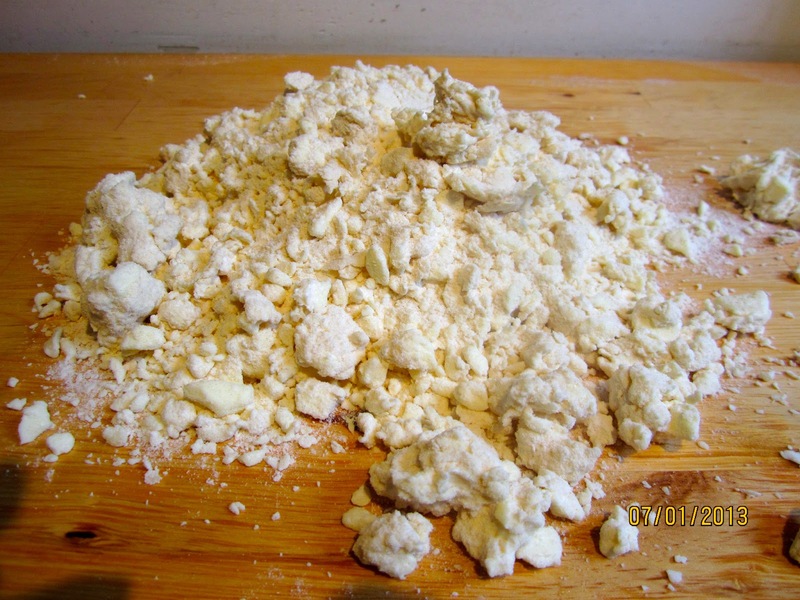 Turn it out onto a floured work surface, and bring it together, with a few quick pushes and kneads (moisten hands with milk, or cover dough with a piece of plastic foil and use it to push without sticking). DON’T GET NERVOUS, ALL WILL BE OKAY! 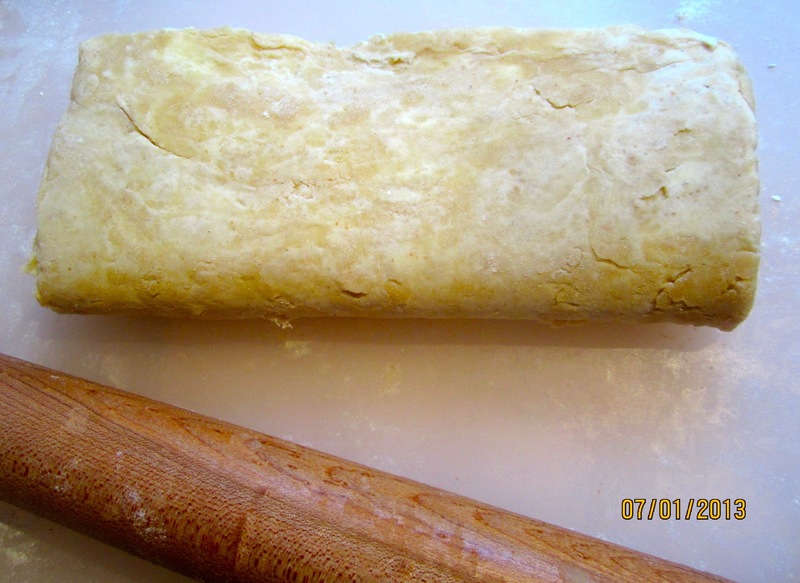 Pat dough into a rough log, and roll it into an 8″ x 10″ rectangle (plastic foil on top prevents sticking). EVEN IF IT’S BRITTLE AND CRACKS, YOU ARE DOING JUST FINE! 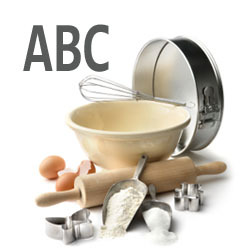 Dust both sides of the dough lightly with flour, and, starting with a shorter end, fold it in thirds like a business letter. 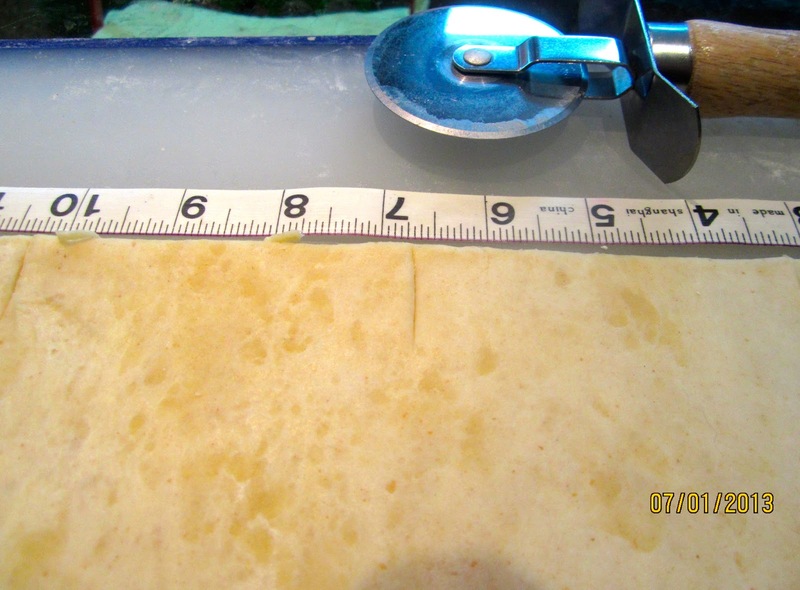 (If the dough gets too soft, and starts to stick, freeze it for 15 minutes to firm up again.) Use a bench knife to loosen it, if it sticks. 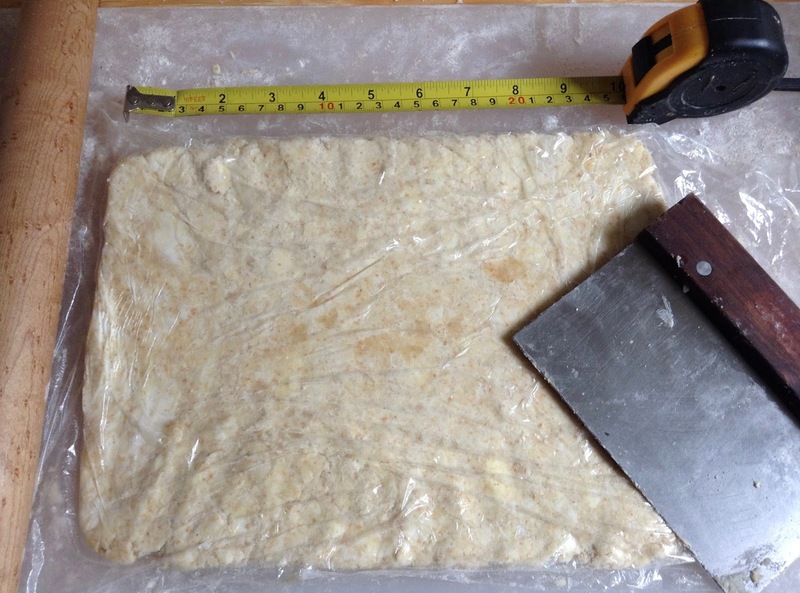 Flip dough over, turn 90°, (re-flour, if necessary) and roll it again into an 8″ x 10″ rectangle. 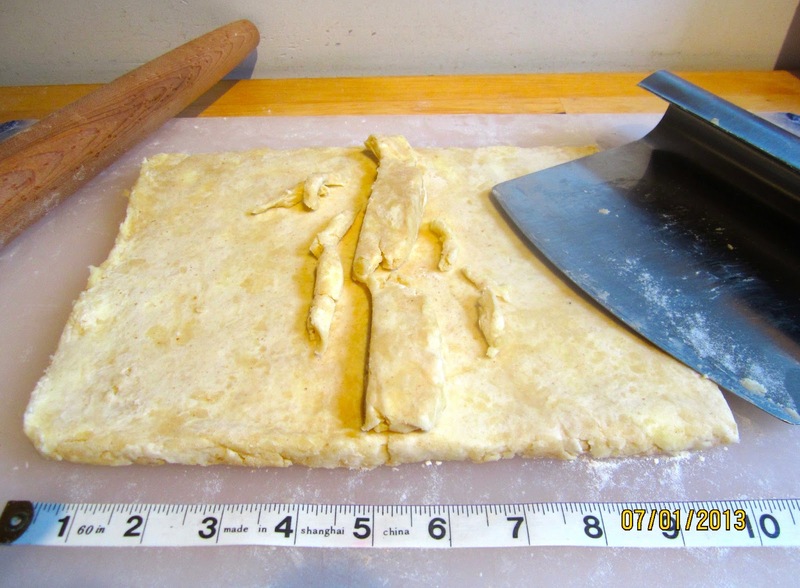 Trim sides with bench knife, placing cut off pieces on top of dough, and fold it in thirds again. 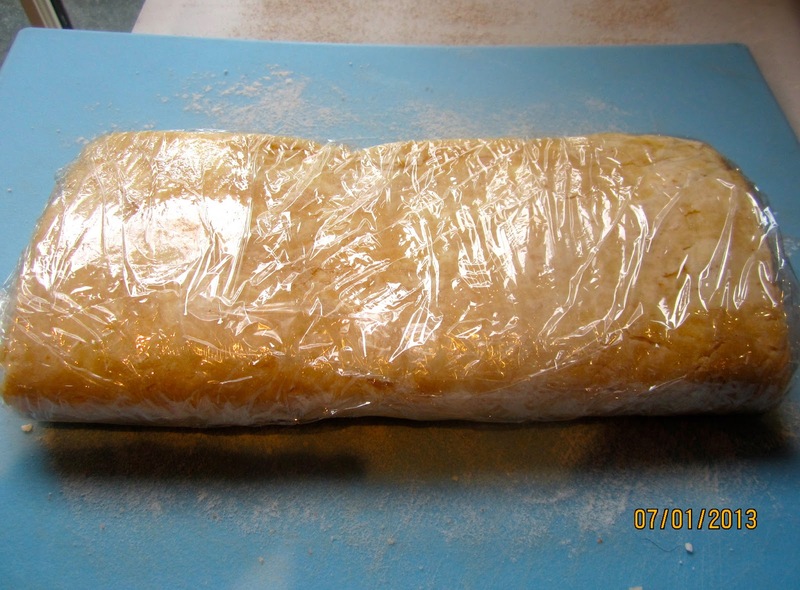 Wrap package with plastic wrap, and refrigerate it overnight. Or, if you prefer to bake the same day, chill dough for at least 30 minutes (better longer) before using. Combine all filling ingredients in a saucepan over medium heat. Cook until mixture starts to thicken, about 5 minutes. (Adjust with more sugar or lemon to taste.) Transfer cooked berries to a bowl, and let cool to room temperature. (Use ice water bath, if you need it to cool faster). Preheat oven to 425°F, placing a rack on the middle shelf. Line baking sheet with parchment paper. 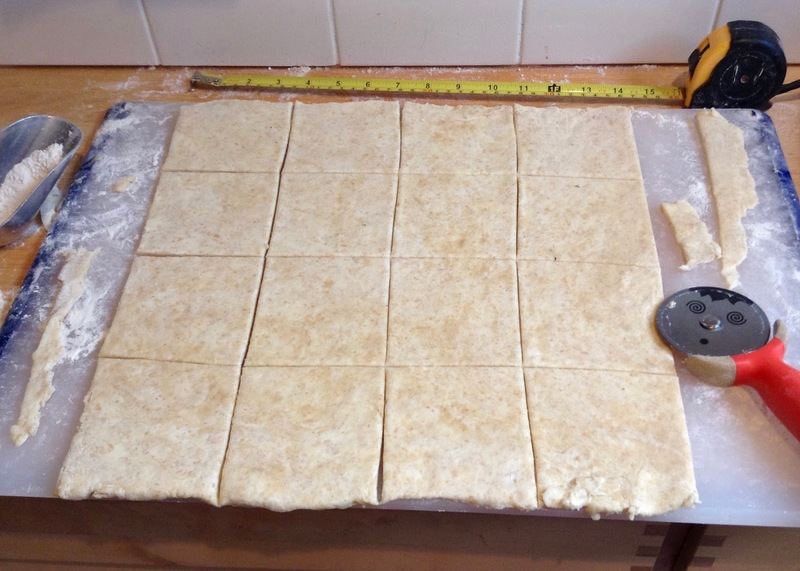 Roll the dough into a 14″ x 14″ square. Trim edges with bench knife. With a pastry wheel, or a 3 1/2″ square cutter, cut out sixteen 3 1/2″ squares. 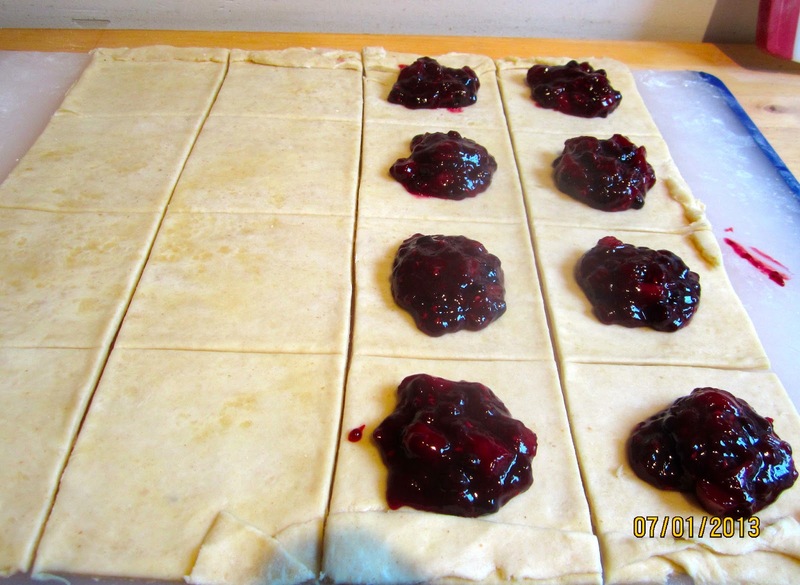 Divide filling among 8 of the squares, using about a heaping tablespoon for each. Brush some of the beaten egg along edges of each filled square. Cut a vent into each of the remaining eight squares, using a decorative cutter of your choice. (Place cut out pieces on baking sheet, they are great as cookies.). Top each filled square with a vented square, place pieces on baking sheet, and press along edges with the tines of a fork to seal. 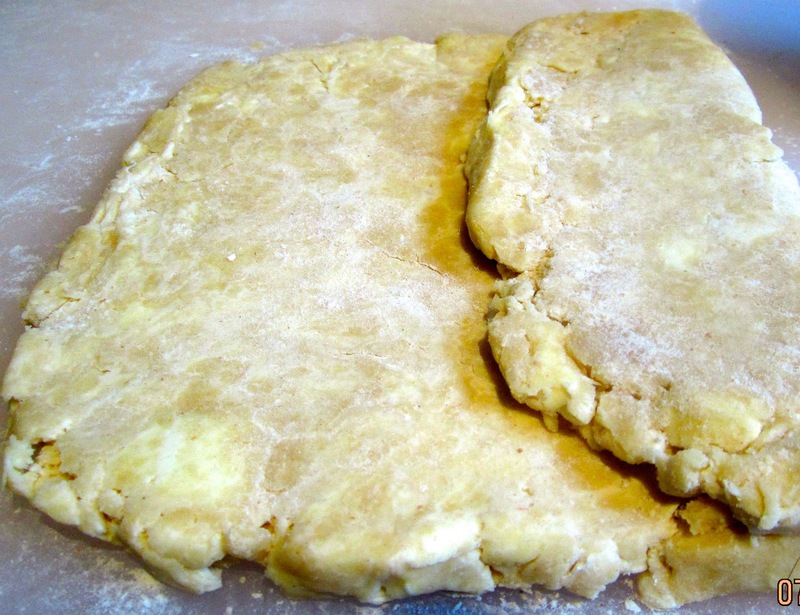 Brush pie tops (and cut out cookies) with remaining beaten egg, and sprinkle with raw sugar. Bake pies for 18 to 20 minutes. Let cool for 20 minutes before serving (theoretically, we ate them, with ice cream, while hot). 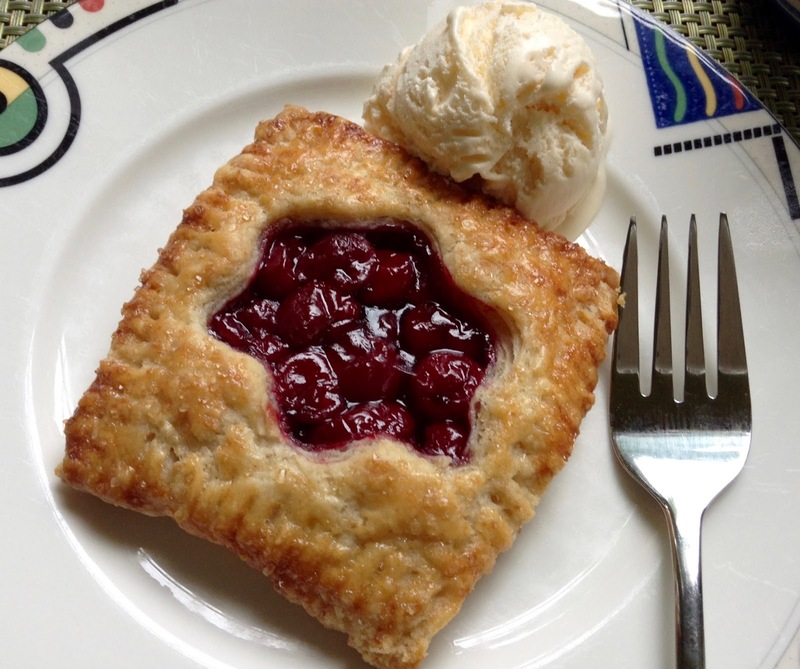 Sour Cherry Hand Pie – my delicious 2016 version! 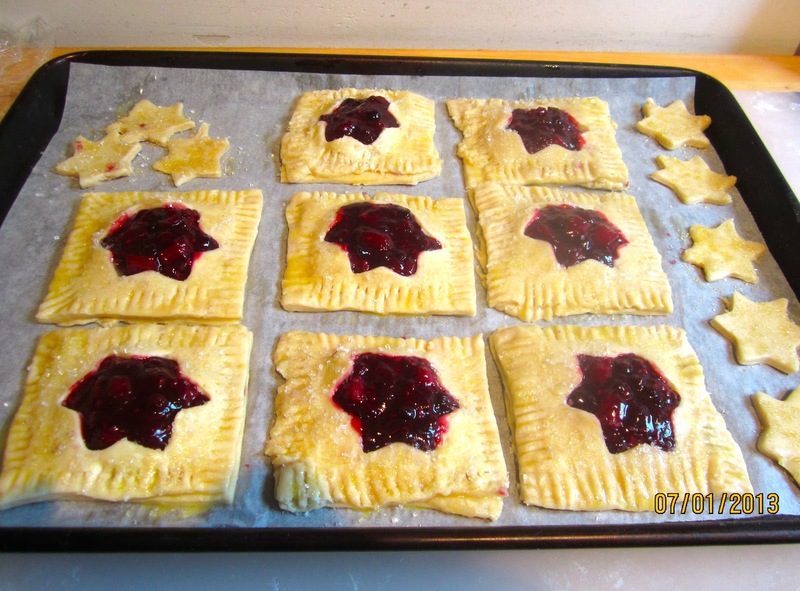 To make ahead: Place unbaked pies on the baking sheet in the freezer. When they are frozen, wrap them individually in plastic foil and put them in a freezer bag. You don’t have to thaw them, you can bake them frozen (without foil) – it will take a little longer. Would you like to join the Avid Bakers? New members are always welcome! Post was updated August 2016. Next Post OLIVE BREAD – DON’T THE ANDERSONS HATE OLIVES? I still keep seen chocolate in those beauties… maybe chocolate + fresh blueberries? thank you fro the step-by-step pictures will be very useful one happy day. Did you know that our native Maine blueberries do not stain the tongue as much as Swedish and German ones do? They are a tad sweeter, too, but much more flavorful than cultivated blueberries. Hello Hanseata they are so cut the cut outs,they sound great and look of the color is nice and you can see that the fruits are coming throw look delicious too with blueberries, raspberries, rhubarb, I have to try your recipe …P.S. and thank you for stopping by to see my whole new kitchen ..
G'day! I love these, true! These will be on my list to do! I love how flaky yours turned out! And the fruit combo sounds awesome. Whenever we moved, the kitchen was the first thing we redid. We couldn't live with tiles that had the color of cow droppings, gray wall paint, and appliances from the early eighties that slurped electricity like crazy. A kitchen should be functional and cozy. Our kitchen is basically our living room. Do try the recipe, it's really worth it! Thanks, Joanne, and please do, these are especially nice! Thanks, Hanaâ. And I'm really grateful that you chose these particular pastries for our challenge. The misspelling happens quite often, “Karin” is less common in the US than “Karen”. Somebody once even thought it was one of those artificial new spellings of a name, to make it sound more fancy. I was shocked! Those look great, and your helpful description makes it easy to long for those pieces. And I also looked in on ABC- would be crazy regarding my time but my fingers itch anyway to join in. Those look delicious! Love all the different berries….yummmmm! Danke, Ninive, und bitte tritt doch unserer ABC-Gruppe bei. Es macht wirklich Spass, und einmal im Monat lässt im Allgemeinen sich auch gut schaffen! Wir sind auch ganz international, da passt du gut dazu. Thanks, Chellie, it was basically what I had, half a bag of frozen blueberries, some puny rhubarbs from my garden, and some raspberries in my fridge. I like your idea decorate the filling with the cut out stars. BTW, do you have a recipe for slightly sweet pumpkin bread (Kuerbis Brot) here? Oh these pies look not just cute, they look awesome. Done to perfection! Well done! Did you like the beer in Jever? Funny, I took photos of some of the same buildings in Schnoorviertel in Bremen – but, of course, not half as mysterious/beautiful as yours! Your pies look wonderful! My dough was the opposite, it was soft and sticky! But it works out great in the end. These pies are delicious! Thanks, Joyce, we really loved them, too. I think a lot depends on your environment, temperature, flour, and the fat content of the butter, too. I would have to say that butter pastry should be commonly listed as a favorite food group for bakers. Smart move to maintain the integrity of the dough. The same trick will work for biscuits that will not cooperate. Thank you for including the recipe. I like the little star design on them as well. I never made biscuits, yet, but I just got the recipe from one of my favorite restaurants here in Bar Harbor, and I'll keep that in mind.